Created in 1842 by Tokugawa Nariaki (the 9th lord of the fief of Mito). Kairakuen in Mito City, Ibaraki Prefecture, is a huge garden covering 127,000-square meter (31.4-acre) that was created by a feudal lord who reigned over this area in the Edo period (1603-1868). The garden is characterized by its exquisite design that makes great use of surrounding natural features; for example, neighboring Lake Senba is used as a pond, which is a key feature of traditional gardens. Kairakuen is considered to be one of the three most beautiful gardens in Japan, along with Kenrokuen in Ishikawa Prefecture and Korakuen in Okayama Prefecture. The name "Kairakuen" means "a garden to enjoy with people." The 9th lord Nariaki Tokugawa who completed the garden not only used it for himself, but also opened it to the public, a pioneering idea that lead to the development of parks. Historical records show that people came here in spare moments from work to play music, sing, have tea ceremonies, and fish in Lake Senba while enjoying the beautiful landscape. 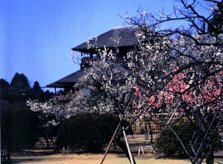 Kairakuen is also famous for its ume (Japanese apricot) flowers; about 3,000 trees of over 100 species of ume trees cover half of the site. Since the flowering season varies from early January to late March, flowers are in bloom throughout the garden during these three months. It is said that Nariaki ordered the many ume trees to be planted because after people had enjoyed the flowers, the fruits could be preserved as food in case of emergency. Photos: Kobuntei, a teahouse of Kairakuen in different seasons (Ibaraki Prefecture).